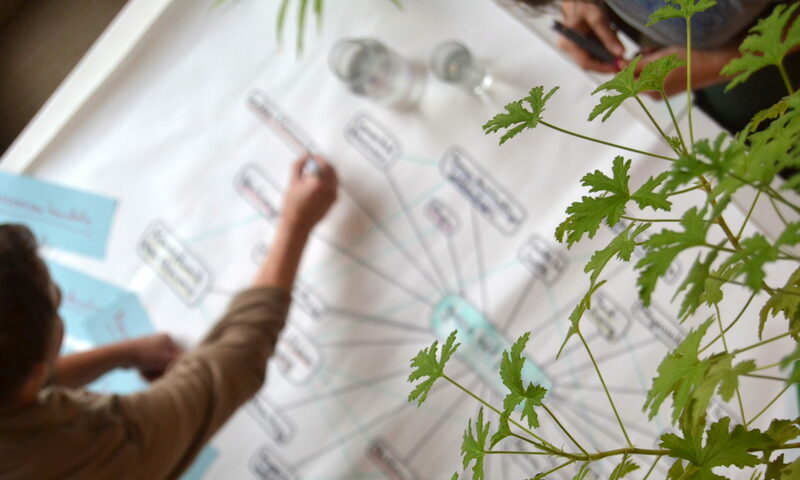 To improve the networking of project groups and to be able to have discussions on a secure online platform: this was the motivation of Transition Regensburg when the group started looking for a suitable solution three years ago. The decision was made for Hubzilla. After a longer testing phase, there is a conclusion now. This is the fourth article of our series “Digital Networking of the Transformation Movement“. An interview with Michael from the group Transition Regensburg. 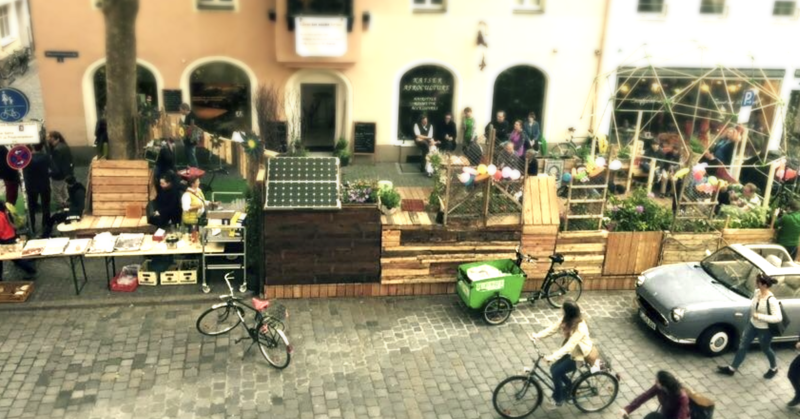 Transition Regensburg is a citizens’ movement and a non-profit association that works with its head, heart and hands for a viable, environmentally and people-friendly City of Regensburg. My job is the technical support, most importantly server administration, and as part of this I also take care of our social network – our own Hubzilla installation. In addition, I organize the networking on campus and I am involved in building a cradle-to-cradle group as a cooperation project. When I did my research, Diaspora and Friendica were high on my list due to their decentralized approach. Diaspora does not have a simple installation routine, which is why users are only on a few servers (“pods”). So I decided to continue with Friendica. The initiator of Friendica, Mike MacGirvin, was also working on a more comprehensive solution at that time that would provide better encryption. This was Hubzilla, then still known under its project name “Red Matrix”. 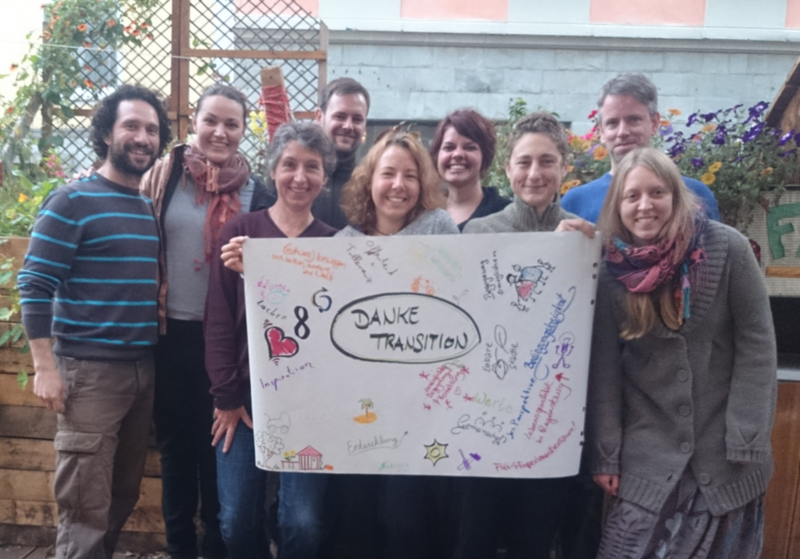 Transition Regensburg has many different groups that are committed to change in Regensburg in certain areas – e.g. groups of community gardeners, food rescuers and operators of a give-away shop. Our intention was to improve networking among these groups. So we wanted to establish a solution so that the groups could learn from each other, discuss openly and help each other within a community. With the help of Hubzilla, we also wanted to give an impetus to the decentralization of social networks. Hubzilla is a finished product that undergoes regular updates. People who are interested in data-protected communication. Basically, Hubzilla can be used by anyone, however, as of today most users are rather tech-savvy. So Hubzilla public channels are often about technology, data privacy and encryption. But also social and political topics are being discussed. There is a website which reports about Hubzilla. Then, there is a lot of communication in the network itself, which also has a channel where you can talk directly to the developers. The exact number of users of Hubzilla cannot be determined, since Hubzilla installations can also be operated as island solutions. In the whole network, there are an estimated 2,500 people. Transition Regensburg has almost 800 people in its newsletter distribution list and 2,800 followers on Facebook. It is hard to say how big the community of active contributors is, because Transition is a citizens’ movement. I would estimate that about 30 people are particularly present here in the context of transition. Theoretically no. In practice, technology and data protection are currently the most important topics. This is certainly due to the users of the network. If other people join in, there will be other topics as well. The main function is definitely the exchange of messages taking into account the privacy settings. With Hubzilla, you can share content very accurately with specific audiences. But Hubzilla also has other functions – e.g. calendar, wiki, contact database, groups / channels. It can also be used to build smaller websites. 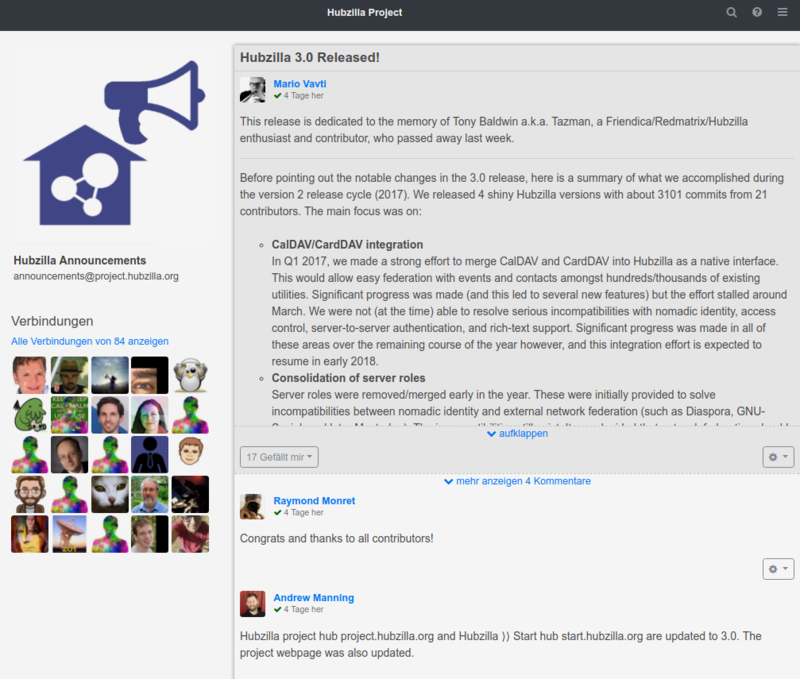 Screenshot of Hubzilla – Hubzilla’s basic layout is very similar to Facebook and other social networks. The exciting thing is that all features are built on Hubzilla infrastructure, which is safe for web servers, meaning that access rights can be determined very specifically for all contents. 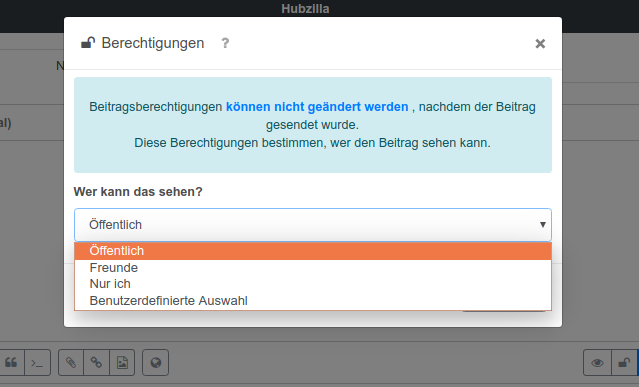 Screenshot of the permissions dialog on Hubzilla – here you can choose who will be able to see a post. Hubzilla is a solution that can provide a wide range of functions for individual users as well as the community. It is a kind of data protection infrastructure which provides the basis for implementing a social network, file exchange, etc. And it is software which is complete and ready to use. The so-called “nomadic identity” is also unique: You can clone your Hubzilla channel to another server. Any activities (such as new contacts, settings) are then mirrored to the new server. If a server fails, you will not be disconnected from the network. As mentioned earlier, the decentralized social networks Diaspora and Friendica already existed when we did our research. There are also new developments, for example the matrix protocol. This also allows a decentralized exchange of messages. It seems to be quite a big thing, but I have not given it a closer look yet. Hubzilla is an individual application programmed in PHP. We use MySQL, in the form of a MariaDB, as a database, which is standard. Parallel to that, the developers are also trying to maintain PostgreSQL. 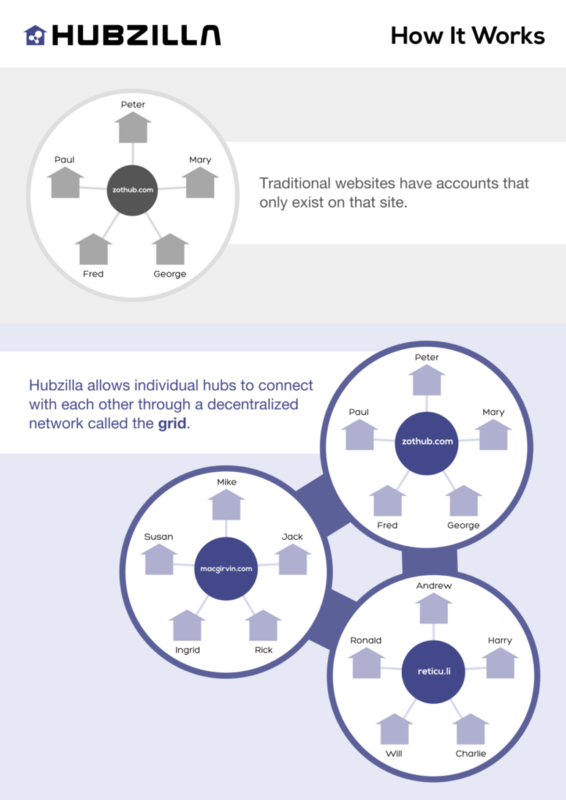 The Hubzilla network consists of several hubs which are individual installations. They communicate with each other via the ZOT protocol, exchanging encrypted JSON messages. Hubzilla can read a large number of newsfeeds, e.g. RSS, and it can even integrate messages from other networks (Diaspora, Friendica, GNU social). Other interfaces are CalDAV and WebDAV. So you can sync Hubzilla’s calendars and files with your smartphone and other computers. CardDav is also under development to sync contacts. Hubzilla is an open-source project that is not entrepreneurial, meaning that all work on the project is voluntary. There is also the possibility to donate, but currently not much money is coming in this way. At the moment, the only recipient of the donations on Bountysource is the main developer, Mike MacGirvin. The father of Hubzilla, Mike MacGirvin, started to develop Friendica around the year 2010. He had already had relevant experience in security and web development outside the project – he had worked as a Unix system administrator at Stanford University and as a developer at Netscape, AOL / Time-Warner and Symantec. The first basics of Hubzilla were published at the end of 2010; in mid-2011, the active development was undertaken. Hubzilla previously had a variety of names: Friendica Red (2012), Red Matrix (2013), Hubmaker (early 2015) and finally Hubzilla (May 2015). In my view, there is a super guru in the developer community – the inventor Mike MacGirvin – plus about 5 very active developers in the core team. I don’t know. On the domain hubzilla.org, you cannot find anything about the registrant, since the registration was handled via a privacy service. Which legal form do the creators have? Yes, donations but also web developers or users who test and distribute Hubzilla are very welcome. Hubzilla is affiliated with other social networks through “The Federation”, so there is cooperation with Diaspora, Friendica, GNU social, etc. Personnel-wise, there are links to Friendica, since Hubzilla has emerged from its orbit. Hubzilla also strives to use open web standards. 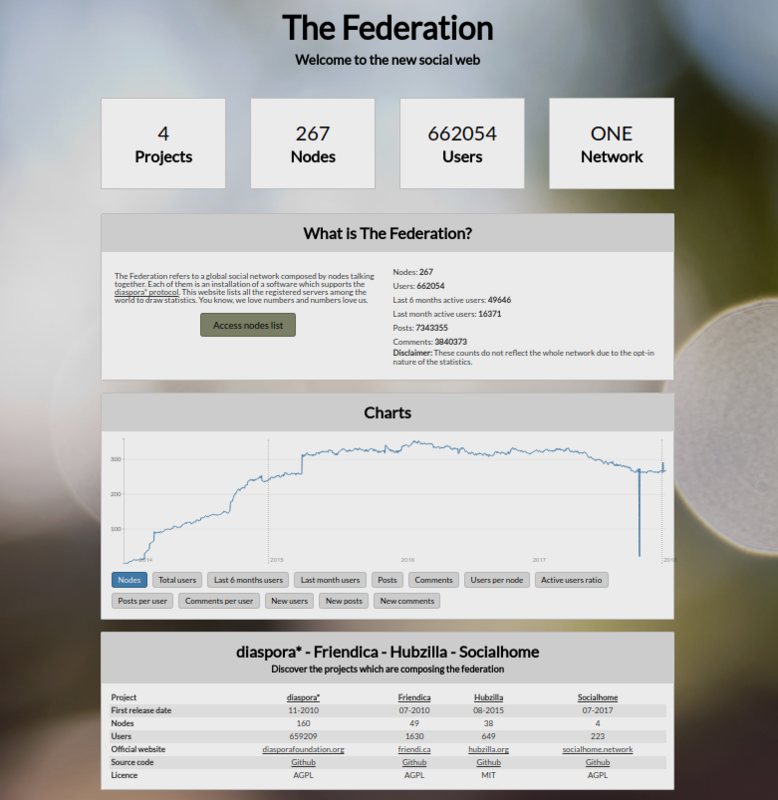 Screenshot of the-federation.info – overview and statistics of the servers in the federated network. I am sure there are discussions about that, but I’m not quite up to date. A bigger goal was and is to merge the community calendar and the CalDav calendar for synchronization (for example with smartphones). There is a project roadmap, but it is outdated. The issues visible on GitHub are mostly minor optimizations and bug fixes. So I do not know where things will go in the long term. Maybe I’ll start with our experiences with the platform. At present, very few people really use Hubzilla actively. Basically, we have the following problem: The individual groups already have their tools they know. There are Facebook and WhatsApp groups and e-mail distributors. For now, all users are happy with these tools and it is difficult for us to sell the added value of Hubzilla. There are some who are interested in data protection, but for most this is not important enough to deal with a new tool. So getting people to use an alternative to Facebook / WhatsApp groups and e-mail lists requires persuasion, user support, and minimal hurdles. And for that we need a team with a lot of time and patience. Moreover, introducing Hubzilla is not the main task of Transition. 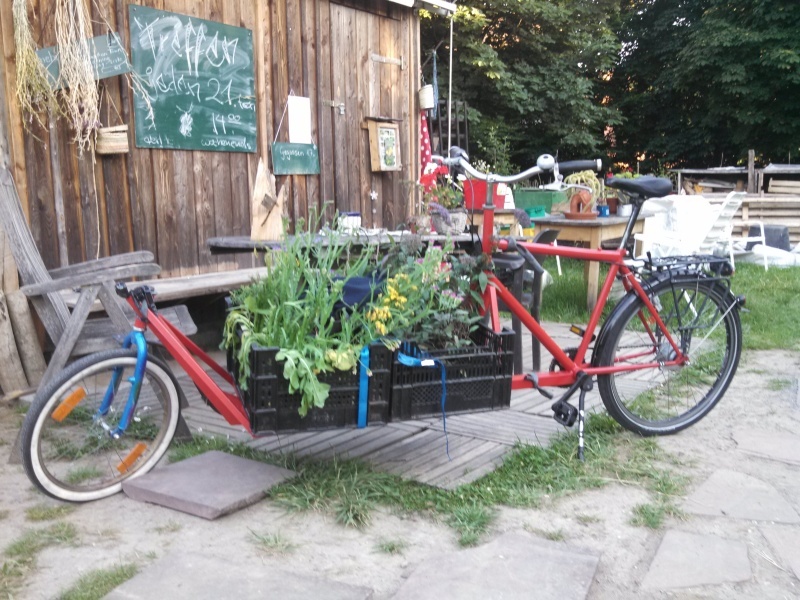 It’s more about specific projects – give-away shop, repair café, food cooperative. Since this is done on a volunteering basis, we just do not have the time to advertise Hubzilla that much. The use of Hubzilla is currently a little dormant, but can regain momentum with each new interested group. In my view, the Hubzilla network is still relatively small in the global context. For reasons of design, the federated social platforms are likely to experience performance problems if they become more widespread. A detailed description of the problems of alternative social networks can be found in the article “2012, und alle Welt ist immer noch auf Facebook” (2012, and the whole world is still on Facebook). I still find the basic idea of ​​Hubzilla useful, because it is very important to me to raise awareness for data protection and to be independent of Facebook and others. And Hubzilla is doing that as well as a web application possibly can. Despite efforts to ensure security in Hubzilla’s design, the administrator of a Hubzilla node can theoretically read private data because each user’s key is saved in the database. Of course this is not possible via the admin interface – but as with any web server application, you do have to trust your administrator in this regard. To make the concept even safer, every user would have to operate their own Hubzilla node. There is also work underway to allow automatic installation on a micro-server (e.g. Raspberry Pi). However, I do not think this is feasible for the general public. Many groups are trying to develop something new to solve this privacy problem. However, that cannot be done quickly. Personally, I also find the GNUnet approach exciting, which claims to make the complete online stack safe (based on a peer-to-peer principle). So this is about an even deeper, more basic level, which also includes the protection of connection data. And there is also a project that wants to build a social network (SecuShare) based on that. I am looking forward to the further developments of that!